When I was home in Texas a few weekends ago, I had two cooking objectives in mind for my visit: grilled vegetables and homemade waffles! Soon after my family moved from one suburb (north of Dallas) to another (closer to Fort Worth) almost 10 years ago, my grandparents moved from Virginia to a retirement community near us in Texas. Within a few months, our tradition of Sunday morning donuts turned into Sunday morning brunch with Grandma and Grandpa. 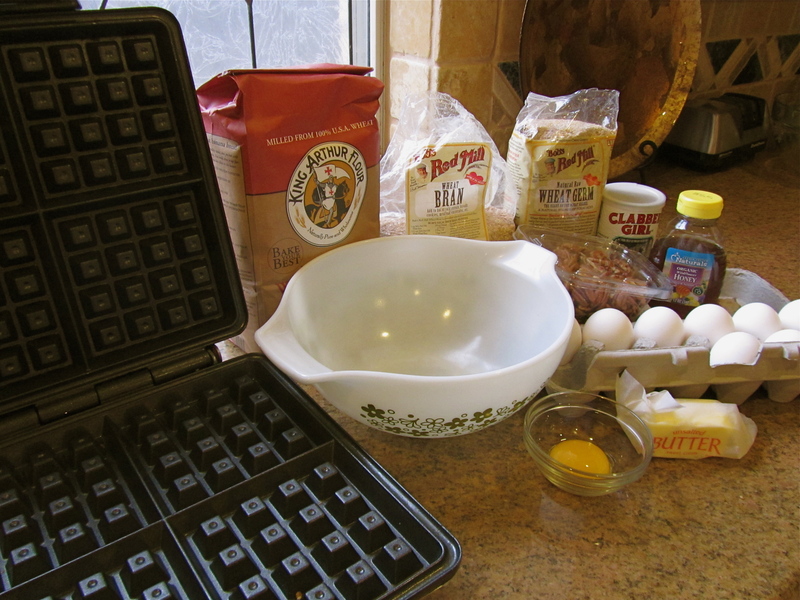 Whole wheat waffles are one of my favorite dishes in our brunch repertoire (my absolute favorite is a German Apple Pancake, but that’s a story for another day), and since I don’t own a waffle iron (yet), I was eager to use my mom’s. Beat egg white in a small bowl until stiff and set aside. Mix together the dry ingredients and set aside. Combine egg yolk, milk, honey, and melted butter. Add to dry ingredients, mixing until just blended. Fold in the beaten egg while until just mixed. Do not over beat the batter. 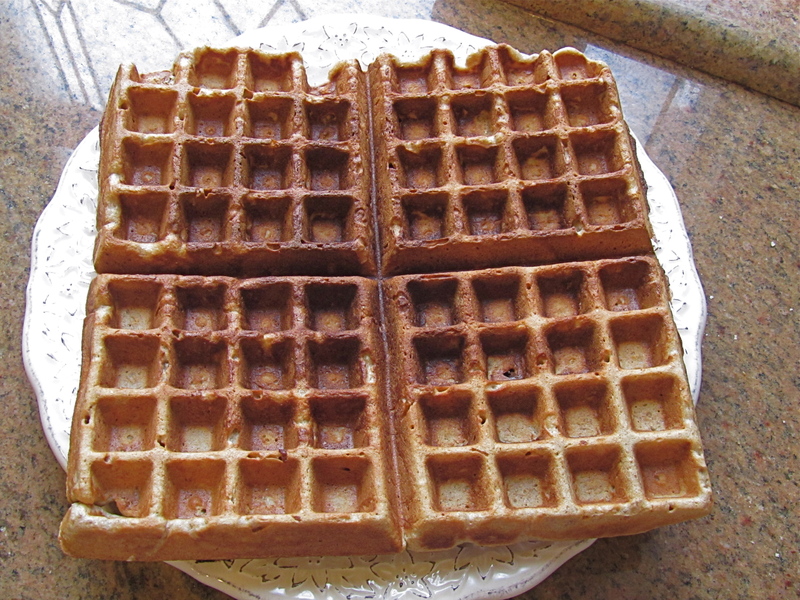 Pour batter into a greased waffle iron. Cook according to manufacturer’s directions. 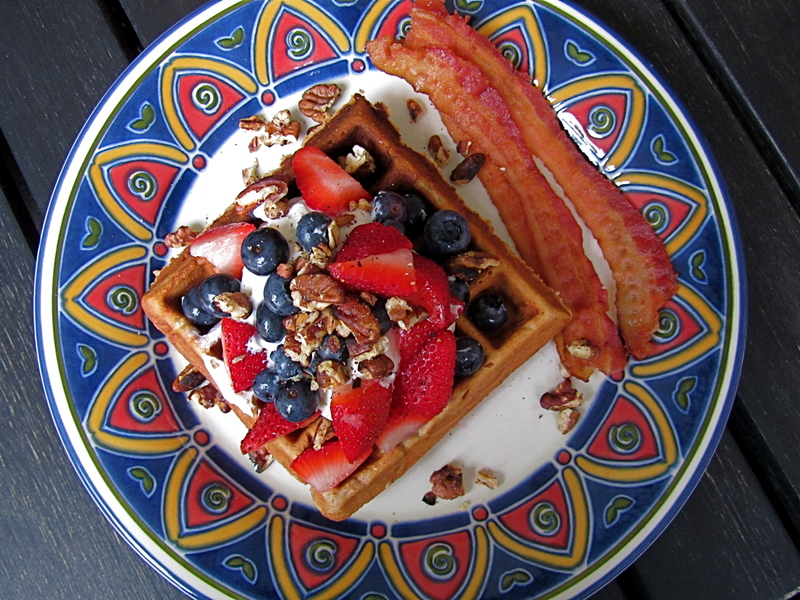 To serve, place 1 – 2 waffles onto each plate. 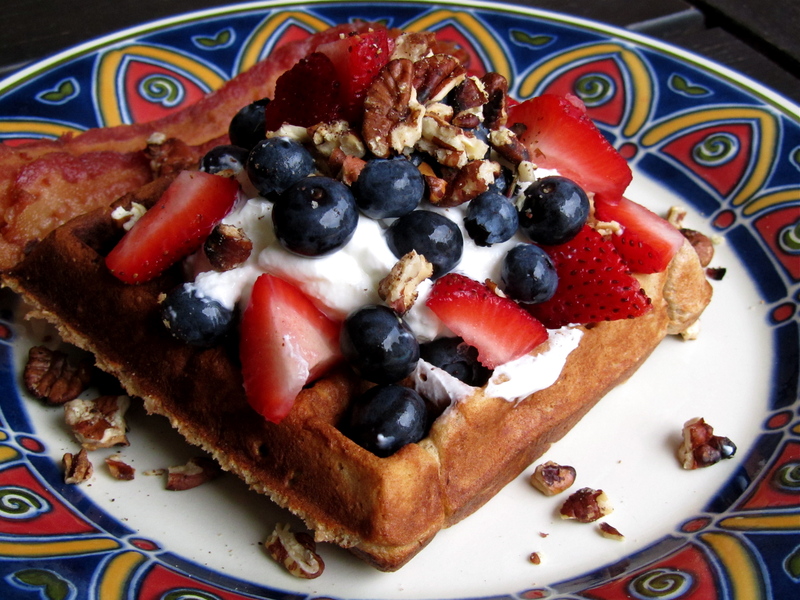 Top with Greek yogurt, berries, and toasted pecans. Sunday mornings were a rare opportunity to sleep in, and my family would ease into our morning, lingering over the paper (we get at least 3 on Sundays), sharing interesting articles, and sipping coffee or tea. While Grandma and Grandpa went to church (my family went to evening service at a different church), Mom, Dad, and “The Girls” would get things going in the kitchen. Dad was in charge of cutting up fruit, and Mom would set the menu for the day. My sisters and I helped Mom cook and set the table, so everything was ready by the time my grandparents arrived. This tradition continued as my sisters and I grew up and left home, and it is something that I look forward to on each visit home to Texas. As Grandpa wheeled into the kitchen in his Kiddie Car, cracking a joke, the house would fill with warmth and laughter. Grandma would get settled on the window seat in the breakfast nook, “supervising” the kitchen activity with one of our dogs in her lap. Grandpa loved blackberries. Grandma loved mimosas. We shared laughter. We shared love. This post is dedicated in loving memory of Doris Kasselman.